More than any visual we’ve seen since the Truth storyline began in the Superman books, this issue shows us a powerful, haunting image that may stay with readers for awhile. The Suicide Squad (Harley Quinn, Deadshot, among others) are the latest to take a shot at the bullseye on Superman’s back now that he’s powered down and his identity his public. Thankfully, he’s got some powerful back up in Wonder Woman. This brawl, which takes place in a cemetery of all places, will have dramatic repercussions. And it will force Clark to take dramatic action. 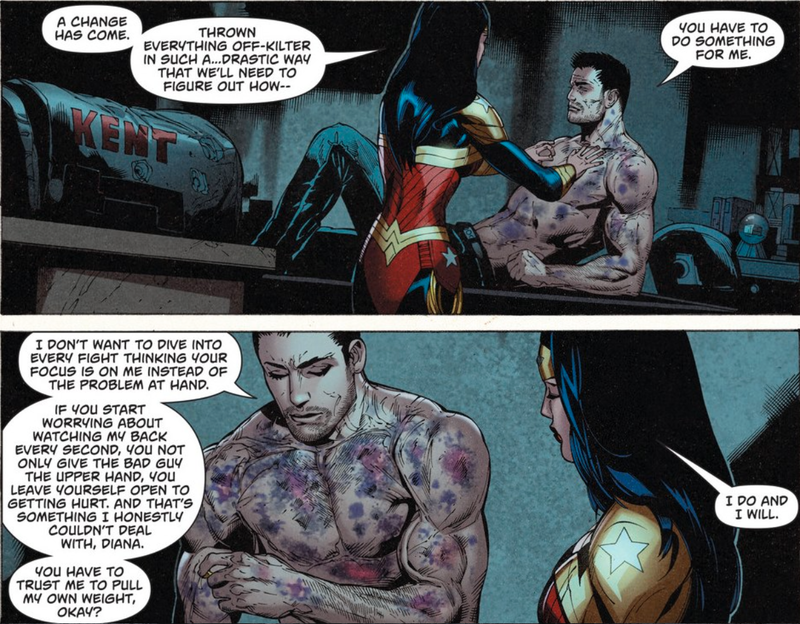 The image of a shirtless Superman with all these wounds and markings and scars on his skin is haunting. The image of bullets harmlessly bouncing off the Man of Steel’s chest is so iconic, that to see him sustain this kind of damage from them hits home. And that’s before we see Diana literally pulling them from his flesh. This also gives us an interesting indication of just how de-powered Superman is. We are, after all, still missing certain answers regarding his exact state of being. This is the first opportunity I’ve had to talk about Wonder Woman’s new costume, so I’m going to take it, despite Tomasi and Mahnke not being the ones who created it. This suit is a David Finch creation. And like most things David Finch draws, this costume is way too dark. Why so much black? I understand the temptation to cover Diana up a bit more, but putting her in so much black is overkill. It reeks of a creative team trying too hard to reinvent the wheel. Considering Wonder Woman’s role as an ambassador for the Amazons, the end of this issue could have interesting implications for her going forward, as well as her relationship with Clark. Things have certainly changed for our heroes as of late. And while not every creative team has handled that change well, to their credit, Tomasi and Mahnke have. 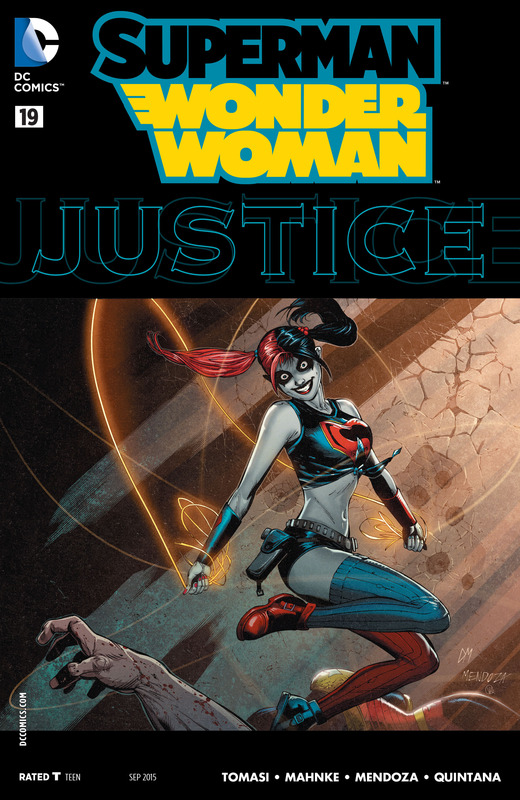 This entry was posted in Comic Books/Graphic Novels and tagged Clark Kent, comic book reviews, comic books, David Finch, DC Comics, Deadshot, Doug Mahnke, Harley Quinn, Peter Tomasi, Rob Siebert, single issue reviews, Suicide Squad, Superman, Superman/Wonder Woman #19 (2015), Superman/Wonder Woman romance, Wonder Woman on 07/27/2015 by primaryignition.